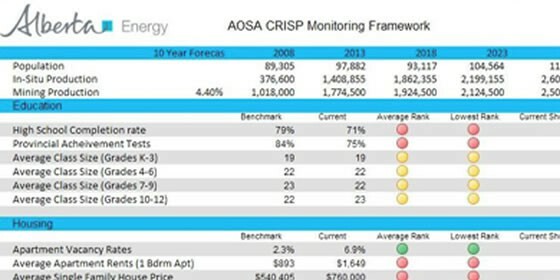 The Athabasca Oil Sands Area (AOSA) Comprehensive Regional Infrastructure Sustainability Plan (CRISP) Monitoring Framework is a tool that can be used to monitor the medium and long term impacts of oil sands development on the region’s infrastructure and resources. A key input into the tool are 35 year population and employment projections for the Alberta oil sands regions. The tool has been developed to consider key areas that the Government of Alberta would like to be able to monitor in terms of demand for infrastructure. The key areas identified in the tool include: Education, Housing, Health, Income, Quality of Life, Municipal Services, Environment, and Transportation. Within each of these key areas, there are several indicators that aim at providing information on the current state of the community. Selected indicators also provide short, medium and long term projections for the demand for infrastructure or resources over the population projection period.